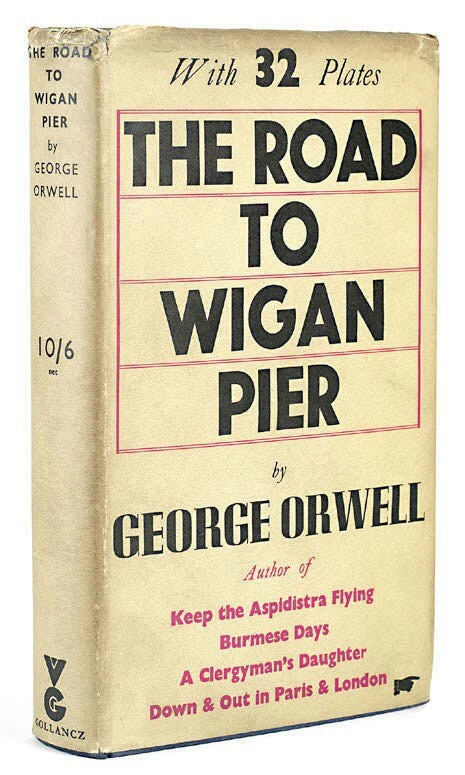 Two first-edition versions of George Orwell’s 'The Road to Wigan Pier', the first part of which is an investigation into the working-class living conditions in Lancashire, Yorkshire and the industrial north, were published in 1937. First edition of The Road to Wigan Pier – £4500 at Bonhams. Much the largest of them was that issued for the Left Book Club, whose 44,150 copies came in a limp orange cloth binding and were priced a 2/6d, or half a crown. The illustrated public edition, issued by Gollancz in their trademark yellow, black and red typographic jackets, numbered just 2150 copies and was considerably more expensive at 10/6d. Sent to auction by a resident of Wigan, the copy of the Gollancz edition shown here sold for £4500 at Bonhams (27.5/25/20/13.9% buyer’s premium) on March 27. Only two copies have made more at auction: copies sold at £9000 apiece by Gorringe’s of Lewes, in 2010, and at Sotheby’s in 2017.